Rockin'Rio wrote: I have found a workaround for this... If you open the hamburger icon, click customize, you can right click on the space, flexible space, and separator. Choose "add to toolbar" from the right click menu. It will add them to the navigation toolbar. From there, they can be drag and dropped to the other toolbars and placed wherever you like. Thanks! Never would have thought of this. Thanks for finding this workaround. If you enable mov. back/forward buttons after applying the code, it will temporarily overridden, but after a restart your code will stick. I wish it would, but after restarting the URL bar has always reverted. If I then go into the options, un-tick and re-tick the "Custom css code" checkbox, it is applied again - until the next restart. Hence my assumption it is not being applied last. Aris wrote: Then make the code "more powerful"
Thanks, that did the trick! I had already tried something in that direction but without success. It seems that the FuzzyTime addon is not being displayed in the add-on bar(i.e. bottom status bar) as expected. I did have it flash appear a couple of times, but can't seem to get it consistent or even to display at all now. I do have another addons' graphic button displayed fine in the CTR bar, but fuzzy time is a text only output. The add-on works for me in Firefox/Waterfox 56, but do not expect to much of it. Last update was 11 years ago. First, thanks for helping on this. Yeah, I know its an oldie at 11 years strong, but its golden, with never an issue, and as you will have seen, it has no settings, it's function is to simply output text to the status bar, that's all. So I tried the tester you posted, but alas no joy here, so, if it's working at your end, then I can only feel a setting that I made in CTR is the root - this would make sense given the flash of FT that I observed. So now I guess it's down to identifying which CTR setting. Last edited by BEngEE on December 23rd, 2017, 4:32 am, edited 1 time in total. 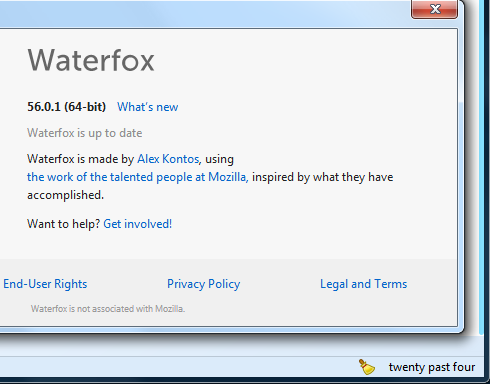 Test Portable Firefox/Waterfox 56 and only install CTR and FT. If it works in the new setup, the issue is somewhere in current browser profile. Reinstall other add-ons one by one. The issue for me is now resolved, so I can move on and enjoy both CTR and S4E in harmony. Therefore, perhaps remove the "Add-on Bar" context menu item when CTR knows that S4E is in use. Is it possible to add feature "focus on the search bar when open new tab" (I have separated address bar and search bar, so focus get on the address bar everytime)? You still can use add-on bar and move all status bar items from S4E there. The note on prefwindow only targets the "movable" status shim not everything on status/add-on bar. Most likely it is possible, but as you see there is not much CTR development at the moment. Aris wrote: Alright, I tested this one on Windows 10 FCU and it works. Windows 10 uses a box-shadow additionally to the border creating this weird ui glitch. Just wanted to pop back in and say that the above CSS finally works! No more annoying highlight around the location bar. Thanks very much for that and Merry Christmas! I would like to remove favicons altogether but I only see the option for pinned tabs to hide them. This will hide all tab icon images, but remember tab loading icon uses the same space, what will case tab text jumps after loading.